A University of California, Berkeley graduate who has been vocal about championing the rights of undocumented people heckled President Barack Obama on Monday during a speech in San Francisco's Chinatown on immigration reform. Ju Hong, 24, of Alameda, who graduated with a political science degree last year from Cal, was standing behind Obama when he began shouting. "I need your help. My family will be separated on Thanksgiving," he said. "Please use your executive order. You have the power to stop deportation." Others at the Betty Ong Center in San Francisco joined Hong and shouted, "Stop deportation, yes we can." Obama firmly insisted that he does not have the constitutional power to bypass Congress on the issue. When the Secret Service rushed in to whisk Hong away, the president said Hong could stay, and the audience cheered in response. Hong later told NBC Bay Area that he supported Obama but has been disappointed about his efforts on immigration reform. 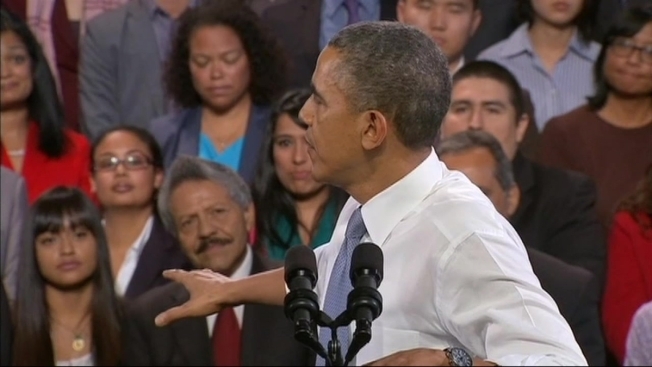 "I respect the passion of these young people," Obama said, noting they're fighting to keep their families together. "But we're also a nation of laws, that's our tradition." "The easy way out is to yell and pretend I can do something" without addressing the laws that require such deportations, he said. "It's not just a matter of us saying we're going to violate the law." "Ultimately, justice and truth win out," Obama said. "We look like the world -- you've got a president named 'Obama,'" the president said. "What makes us Americans is our shared belief in certain enduring principles, our allegiance to a set of ideas, to a creed, to the enduring promise of this country." Later, people who worked at his organization, ASPIRE, stated that Hong is not going to be ripped apart from his parents during the holidays, but that he can't go visit extended family in South Korea, because of his undocumented status. Hong came to the United States when he was 11 with his mother and sister on a tourist visa, but told reporters later that they ended up staying after the paperwork expired. Hong is currently a research assistant at Harvard University and serves on the DREAMer Advisory Committee at the International Institute of the Bay Area, according to his LinkedIn profile. Previously, he listed himself as an outreach coordinator at the Asian Pacific American Labor Alliance, a legislative intern for San Francisco and a senator at Associated Students of the University of California. While a student at Cal, Hong was featured in a UC Berkeley Campus Life YouTube video in 2012, produced in conjunction with a $1 million grant from the Evelyn and Walter Haas Jr. Fund for scholarships to go to undocumented students. At the time, UC Berkeley had 200 undocumented students from 20 countries. In Hong's video profile, he talked about how he had lived an upstanding life all the way through high school, earning a 3.8 GPA and participating in student activities, only to learn of his tenuous legal status while filling out college applications. He said he spoke out publicly about his undocumented status because staying "silent would be worse." NBC Bay Area's Cheryl Hurd contributed to this report.